Today’s Friday evening post is from RNM1953. Though sombre, it is nostalgic – perhaps the music this evening should be from that wonderful era of the early 1970s? Where was I in 1975? I was living in what’s called the inner west of Sydney and at the time of the Dismissal had just finished my BA. Dip Ed ( thanks to a scholarship ) and was anticipating work in the NSW Education system in 1976. Lillee and Thompson were destroying the English in the cricket. The Bee Gees’ Jive Talkin’ had been a number 1 hit. Daylight saving had been in for four years and when in your early 20’s those summer days did seem to last forever. 1975 was my third federal Election after 1972 and 1974. It was the third time manning polling booths, doorknocking, letter drops, driving around in the local member’s car with the speakers on the roof, erecting posters etc. 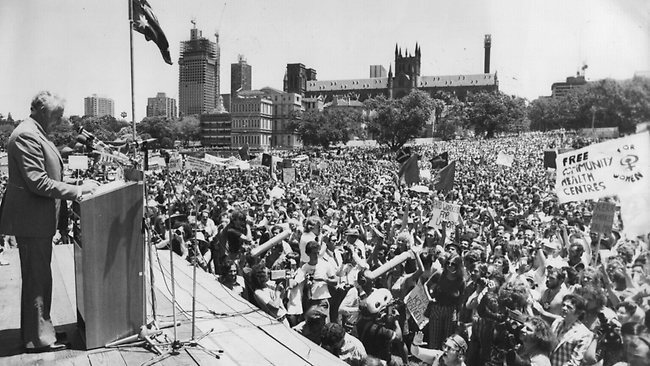 For those of us on the ALP side of politics 1972 was a time of passion and enthusiasm. It was a look into the future. There was a feeling of hope. 1974 was more about determination. The Libs were spoiling and there was no way we were going to let them regain their mantle with their born to rule attitude. 1975 was also a time of passion. But it wasn’t accompanied by hope – this time there was a deep anger. From 1974 onwards, Murdoch turned against Labor. Supposedly because Gough denied him the position of Australian High Commissioner to London. In those days, the printed media had a far greater reach than today. There were morning and afternoon editions. Television, while not in its infancy, still didn’t have the tabloid format that today’s stations have with their morning shows. John Laws was probably the only talkback radio host. On the other hand we had the ABC which was an institution of integrity filled with courageous and pioneering journalists. James Dibble presenting the news, TDT week nights with Bill Peach, Four Corners on a Saturday night. Journalists learnt their craft at the ABC and many were subsequently poached by commercial organisations. Could you imagine the likes of Uhlmann, Crabbe et al worthy of being poached today? So the ABC always provided a balance to the screaming headlines of the Murdoch press. We couldn’t say that now, could we? Through late 1974 and then into 1975 there had been a relentless campaign. Affairs, scandals, strikes by petrol tanker drivers, strikes by electricity generators real ,imagined or what many of us felt, manufactured — all creating an air of instability and all whipped up into a frenzy by the Murdoch press. It sounds familiar. Throw into the mix the Cold War. Doug Anthony was a close friend of the CIA station Chief in Australia, Richard Stallings. The US Ambassador to Australia was Marshall Green. At the time the belief was that every country that he’d been appointed to had had a coup. Even if we look at his entry in Wiki today, there’s a reference to him as having been implicated in the dismissal of the Whitlam government. Also there was a belief that the coups in Greece, Chile and Australia all around the same time were connected to the presence of Omega bases. These bases were an integral part of American surveillance of Russian submarines. There had been campaigns in these countries and our own to close those bases. That was the atmosphere leading up to 1975. It would take forever to talk in detail about the events surrounding the coup and that’s not the point of this post. So, if it can be termed this way, what were my highlights of the 1975 campaign? I’d just finished uni so had time on my hands. Opposition signs/posters were fair game. In the early hours of the morning newspaper bundles were known to disappear. Many of the journos went on strike and published their own newspaper. We distributed those at railway stations. We heckled at Lib public meetings. But the three big items for me were firstly a march from Sydney Uni into the city. From memory it ended at Hyde Park but I can’t be sure. It was an incredible experience. Marchers had stolen the RTA signs from expressways that read STOP. YOU ARE GOING THE WRONG WAY and carried these 10-15 people abreast down the main streets. All the while men were standing in vantage points photographing the marchers. The chant was Shame, Fraser, Shame, and it reverberated around the city buildings. Office workers left their desks and joined in the march. There wasn’t any attempt by police to stop the march and there wasn’t any violence, but I suspect that the police resources wouldn’t have been strong enough to stop the surge anyway. The traffic lights would turn red but the sea of marchers was like a wave that couldn’t be pushed back. The second event was a fundraising barbecue we had at my parents’ house. Local members and some nearby Federal Ministers arrived. It’s impossible to estimate the number of people, but just word of mouth brought maybe 500 to 1000 people to this backyard barbecue. A couple of people found some road barricades and blocked off the street. Another person, and remember these were unscripted, they just did it off their own initiative, redirected traffic, standing in the middle of the road. Others walked up to the local pubs and main street shopping and encouraged anyone who was out and about at 7pm that night to come down to the barbecue. The barbecue itself was planned but the spontaneous reaction of people was truly amazing. We actually raised money but the money was dwarfed by the emotions on display. The other highlight was Gough speaking at The Domain. We went in by train and our badge of honour was Shame, Fraser, Shame. The carriages were full of people wearing these badges. The stations were crammed. From memory there wasn’t much humour. There was determination, anger, and a sense of solidarity. I don’t know how many people were there that day. The Murdoch press said maybe 20,000. I think the Sun newspaper said well over 100,000. The bottom line is that you couldn’t fit any more into that area. The hair still stands up on the back of my neck when I recall those scenes. When we manned the booths on election day, we had the biggest turnout of volunteers ever. But it wasn’t enough. It’s hard to put those memories and feelings into words except to say that nearly 40 years later they are still important. 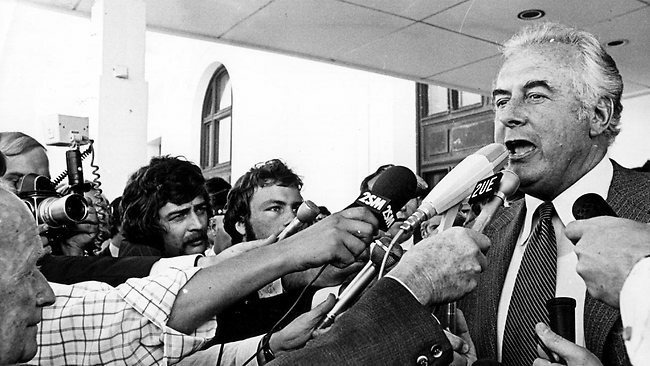 We are all familiar with the legacies of the Whitlam government and 1975. For me, though, one of the most important things was a failure. Forget for a moment the politics of the time and the political effectiveness of that government. Forget for a moment some of the practicalities. Rex Connor wanted to borrow $4 billion for the government, as representing the people, to buy all of our natural resources. Imagine where we would be today if our nation owned every piece of coal, LPG, oil, iron ore, gold etc. in the ground. Has anything changed in 40 years? It’s been a long day, and there’s a longer one in prospect. It looks promising – thank you. I just read the Rand wiki page. She was nuts! Yup, Complete froot loop. I will post my all-time favourite article about her tomorrow when I’m back at the keyboard that doesn’t have a mind of its own. So where do we go to my lovely? An excellent question for the next thread – would you be so kind as to repost?